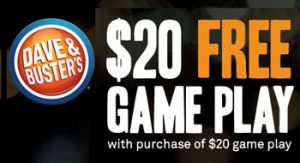 Receive $20 in Free Game Play at Dave & Busters with the purchase of $20 in game play or reload. Valid at all 5 Chicago area locations only. Chicago, Addison, Vernon Hills or Orland Park, and Rosemont Illinois. Chicago’s leading restaurant, sports bar and entertainment complex offers 5 convenient locations, Addison, Vernon Hills, Orland Park, Rosemont and Downtown Chicago. There’s no better place to take your family and friends to eat, drink, and play! We’re the place where great food, signature drinks & one-of-a kind fun under one enormous roof. With beautiful private rooms, four bars, billiards tables, & the newest and greatest games & simulators, There’s no better place to take your family and friends to eat, drink, and play! Dave & Buster’s is also the perfect place to host a birthday party, office get together, team builder, or just for fun event.